The old dictum said, “Prison is for men”. This only explains the association of virility and land. Prison in our beloved country is for children too. It becomes an issue of honor betrayed. Of moral and social order lost. 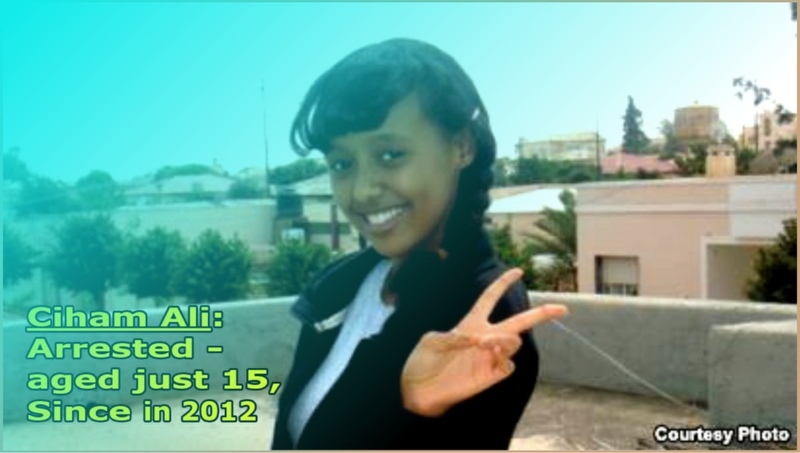 Ciham Abdu, you were a child when you were arrested by the regime in Eritrea. At your age then, others go to the movies, transition from the feelings of young girls meet young boys. Of fathers taking a walk with daughters and mothers teaching the family’s secret kitchen recipes. All this you missed because you were taken to an undisclosed location and marked as “political prisoner”. We hear you are forfeiting for others' political sins; for the sacrifices that ingratiated themselves to the current regime’s resulting in making you the scapegoat. Nevertheless, we have to admit that we too made you a pawn in this hard political game taking over our country. Ciham, you did not transgress any law. You did not engaged in politics. We know you as the young girl flashing the peace sign with your hand and delivering it with your smile. I see your arrest as an admission of a political struggle coupled with a social fight leading to subjugation promoting the scale of defamation of prisoners. Here is my wish and my dreams for you, Ciham dear. I hoped you would walk out of that place on March/2019, having seen a US delegation visiting our land. I hoped that they – new parents themselves – brought up and expected your release. Believe you me, I was hoping Congressman Joe Neguse would walk to the plane holding you and whispering words of hope in our ears. I hoped to see that on international TV screens! After all, we saw the Prime Minister of a country neighboring to us, flying to foreign countries and going back home with his fellow citizens released because of his strong demand. Why not US Congressman Joe Neguse to be there for his own blood and the same DNA of his young daughter? Why was he not there for you? He is a new father of a gorgeous girl that reminds us so much of you. It did not happen! Do not give up Ciham gualey! The day is closer when you will walk out of jail because of your strength and the speeding maturity you earned in prison. We will be the euphoric crowd with limbs outstretched to touch you. We will be the voices that will protect you with an ironclad determination that nothing will happen to you again! We will look for a glimpse of your smile and you will waive the peace sign at us! Our responsibility is to fight and never let anyone forget you, but it is also to protect you once you come back to us. I feel that you earned a strong character in such place, but I ask you never to harden your heart Ciham dear. Your life is historic, your future much more. When trust is lost among Eritreans, I ask you to trust us! You will exist prison’s gates and unbearable fear will never be part of your life. Former prisoners that made it out told me that when one go to jail all falls apart in their life. They told me that bellowing became part of them because the prisons’ guards shouted at them for no reason. Please, do not feel let down at each turn of the day. Ours’ might be a traumatized society, but love for one another is never lost. Trust us Ciham, trust the many that are your voice. A purification of our souls we learn from you. In this era defined by the “Arab Spring”, we hope to hold hands and never see our beloved Eritrea transition from despotism to a blood soaked civil war, but be fortunate to hold you in our arms and re-build our country. An Eritrean Martyr said: “Peace is a wall we will all create by building it brick-by-brick together”. The strongest brick is you Ciham Abdu! If I was Gual Ankere and living in Eritrea, The most important part I force myself to remember.